...... And once you buy one license, you could get the free upgrade service. So there is no risk to buy! Now please download to try it and find more features! If you want to merge the selected contents into one file you can check the ?Merge into one file? option. As default the merged file is named after the first selected file (either a title or a chapter). 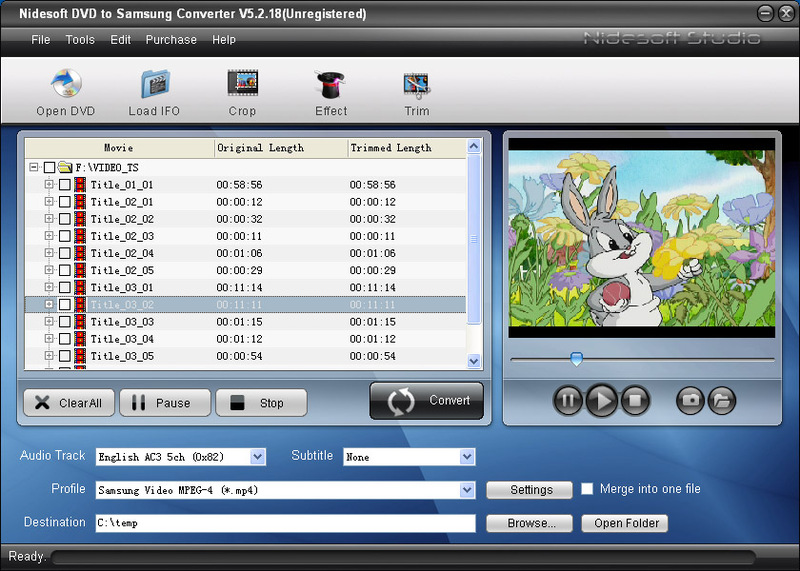 Convert DVD to Nokia Video and Audio MP4,AVI,3GP,WMV,MP3,AAC,etc..
Qweas is providing links to Nidesoft DVD to Samsung Converter 5.4.78 as a courtesy, and makes no representations regarding Nidesoft DVD to Samsung Converter or any other applications or any information related thereto. Any questions, complaints or claims regarding this application Nidesoft DVD to Samsung Converter 5.4.78 must be directed to the appropriate software vendor. You may click the publisher link of Nidesoft DVD to Samsung Converter on the top of this page to get more details about the vendor.